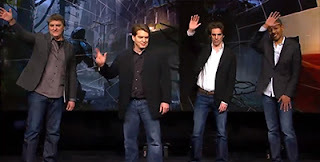 Playstation 2013 Conference New PS4 Console and Games! Well let's talk about that shiny new controller first shall we? 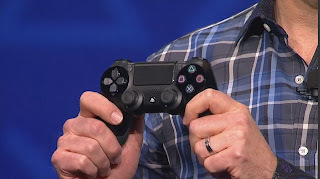 It is very similar to past Playstation controllers, but with a bit of an upgrade, most notably in the addition of a touchpad right in the middle that will add some functionality to games. Sony is also improving response times and lowering latency, allowing users to have more precise control when they play. The rumble system should also be better and there will now be a headphone jack and a share button (more on that later). Another addition is a lightbar to the top, which is said to provide an easier way to identify players. There will also be another peripheral that works in conjunction with the PS4 controller, which will be a stereo camera that will track the 3d positioning for more motion sensing capabilities. 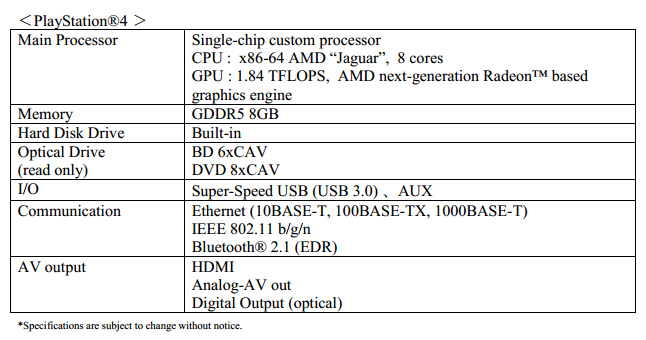 All of the hardware specs. There are lots of other features being added to increase functionality and consumer ease of use. 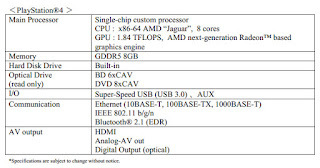 As far as hardware, the PS4 will have the technology that lets it download and update games in the background as you are playing or doing other things. You can also start playing new games pretty much instantly - there will be no need to wait until an entire game is finished downloading before you can try it out. In fact, Sony is trying to eliminate a lot of the waiting found in current gaming. Gone are the days where you will have to wait anxiously for the system to boot up. With a new low power state you can simply turn on the machine and play right where you left off. Social features will also be playing a big role. The Playstation Network will be able to integrate more with your social profiles and enable easy sharing. As I mentioned above, there will be a share button on the controller itself where you can quickly tag and upload gameplay videos. 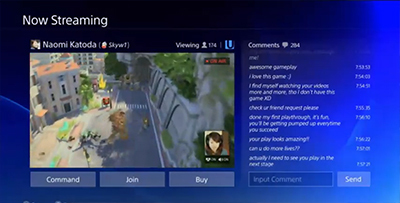 There will also be support for integrated streaming straight from the console to either PSN or Ustream in real time. One aspect of this I found particularly engaging is that friends will actually be able to take over the controls for you or offer up other help if you get stuck in a certain section of the game. That's pretty neat! Stream right from your PS4! The PS4 will bring features not just to your traditional TV, but also other devices that you already use. For example the PS Vita will work much like the WiiU controller, where you can play games on this smaller screen from the console over WiFi with Remote Play. If you have an iPhone, iPad, or Android device, you can use these as a second screen and view maps whilst playing, purchase games and have them download when you're away from home, or watch other people's gameplay. This streaming cloud technology won't just be for PS4 games, we will also hopefully be able to play PS1, 2, and 3 games on any screen or device. In this way, the console appears as though it will be backwards compatible, but you might not be able to get the most out of this service unless you have good internet speed and enough monthly bandwidth to stream all of the data. Another thing they mentioned that I'm not sure if I like the sound of is how much they want to personalize the console to you. I don't mind targeted ads too much since I'd rather see things I might possibly be interested in, but the PS4 will take it even further. You'll be able to see information shared by friends and get recommended content of course, however Sony wants to learn as much as they can about you to actually predict and load up games for you before you've even bought them... WTF. I'm assuming this will mean it actually downloads the games it thinks you will buy, which I am not okay with. In fact I find it a bit creepy and I definitely would not want them trying to meet my "potential needs" in this way. PS4: Just do what I tell you to do, okay? Thanks. Knack - a third person action game where you are a cute robot that can shrink and grow in size. Killzone Shadow Fall - nothing super exciting here. Looks to me like a generic FPS that is set in a high tech city. It does look very pretty, though. Driveclub - driving game focused on collaborative gameplay in teams. It is not specifically about racing, but completing challenges amd driving great cars (with great amounts of detail) in great locations. Infamous: Second Son - what happens when people get superhero powers? And who exactly is in control? This dark game makes us question our security vs. personal freedoms. Deep Down - developed by Capcom on their brand new Panta Rhei game engine. Set in a fantasy, Medieval environment, slaying dragons and all that. Looks quite promising! Final Fantasy - no video but a new FF game was announced. They did have a Luminous engine tech demo, however. Diablo 3 - Blizzard is trying to get back into the console business and take over the world. They are releasing Diablo 3 for both PS3 and PS4. Watchdogs - Ubisoft showed a bit more about Watchdogs. This game looks really fun! It explores how we are all connected and what can happen when someone manipulates our personal data to their advantage. You can control lots of different technologies and invade people's privacy then see how the world changes dynamically around you. 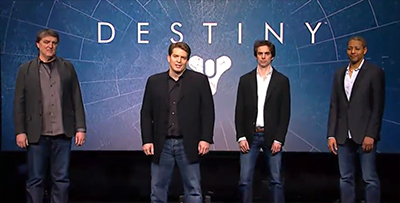 Destiny - Bungie's new IP. This FPS is a persistant online world where you can grow and customize your character. The co-op is also supposed to be pretty great. 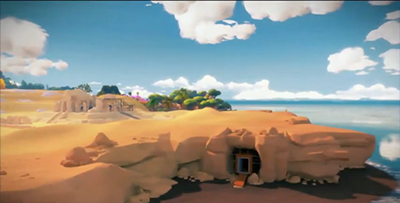 Exploring a mysterious island in The Witness. All in all, some of the new features on the Playstation 4 look very nice! But at the same time I feel like a lot of them are kind of unnecessary and get away from what the console should be about - playing games! I just want good, interesting games that are not afraid to take risks and push boundaries. And if they look pretty too, that's just an added bonus (although the PC will always have consoles beat in that department >:D). So, I think the thing that will make this console successful is if they keep focusing on letting people create their own worlds and content, while also catering to indie and normal devs to give them as much creative freedom as possible. Both are things the PS4 looks like they really want to, so I am hopeful! Did you watch the press conference? What did you think of Sony's new console and what are you looking forward to? Let me know in the comment section below! The awkward Bungie clones say bye! Me neither, it was all very bizarre and the three extra guys were completely pointless. But I did find it amusing how they dressed and acted pretty much the same... from the motionless arms to then all waving in sync at the end! Guild Wars 2 Outfitter - A community website idea where users can create and share their own custom outfits.